Let’s now learn about and use the 1-Wire bus protocol to read the ambient temperature using a temperature sensor. To do that, we’ll first build a circuit using the 1-Wire temperature sensor. After it’s built, we’ll control this circuit with a script. The 1-Wire protocol is a bus-based protocol that uses, as the name implies, one data wire to transmit data between devices. It’s similar to the I2C protocol, but it has a longer range and a lower data rate. The protocol may also be found written as One Wire, One-Wire, or sometimes 1W. For consistency, we’ll be using 1-Wire in this and other guides. In code, we’ll use oneWire or OneWire because variable names cannot start with numbers in Python (and several other programming languages as well). To make 1-Wire work with the Omega, we must first label a GPIO as a 1-Wire master bus. This will be the main contact point between the Omega and any 1-Wire devices. Once we have the master bus set up, we can then scan for the sensor through it and read from the sensor as needed. The Omega does not have a dedicated hardware controller for this protocol, so we’ll have to send some low level instructions directly to the bus. This will be a good opportunity to learn about the process of reading and writing files. The Vdd and GND pins are for power and ground, and the DQ pin is the data line (both input and output). 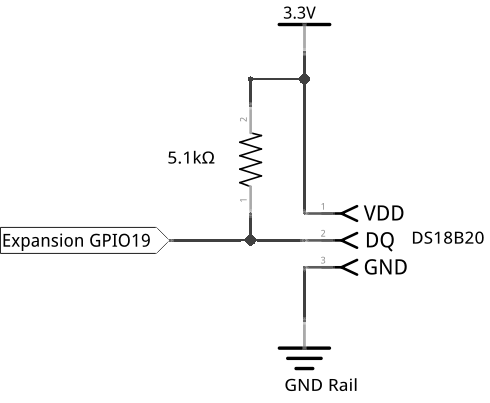 You will typically need a pullup resistor (approximately 5.1kΩ at 3.3V) between the DQ and Vdd lines so that you can properly read the sensor’s output. Note: We will treat the flat side as the front. We’ll be building a circuit to connect the 1-Wire temperature sensor to the Omega. As the name implies, only one data line is needed for communication between any and all devices on the bus! With the front of the sensor facing the middle gap of the breadboard, insert the three pins across 3 adjacent rows. Connect the 5.1kΩ resistor to both DQ (pin 2) and Vdd (pin 3). Connect GND (pin 1) to the Omega’s GND pin. Connect DQ (pin 2) to the Omega’s GPIO19. Connect Vdd (pin 3) to the Omega’s 3.3V pin. The reason we have this resistor is to make sure the max voltage of the DQ pin is equal to the voltage provided by Vcc. If it isn’t properly referenced, a HIGH from the DATA line might appear to be LOW, making the data untrustworthy! First, let’s create a base class for any generic 1-Wire device. This class will handle all the file reading and writing needed to interface with 1-Wire devices. Creating an object of this class will associate a GPIO pin with a 1-Wire bus, and the object will act as a clean interface between code and the low level 1-Wire functions. This is exactly how libraries are written! # it's also called a "module", but it's actually software for the Omega's firmware! argBus = "bus0=0," + gpio + ",0"
self.slaveFilePath = oneWireDir + "/" + self.address + "/" + "w1_slave"
print "Kernel is not recognizing slaves." print "Device is not registered on the bus." Let’s create a file called temperatureSensor.py to hold some more code. This file will implement a TemperatureSensor class. Objects of this class will represent a single DS18B20 sensor in code. Like in our previous experiments, we’ll instantiate a OneWire object inside the TemperatureSensor class. The class functions will then send it the signals that we want and retrieve response data from the sensor without us having to worry about the underlying 1-Wire functions. This way we can focus on the logic of what to do with the data. print "The supported interfaces are:"
# add more __read() functions for different interface types later! Now let’s write the script for the main routine. Create a file called STK08-temp-sensor.py and paste the following in it. This script will use the two classes we’ve created to continuously check the sensor and display the data to the console. Through abstracting out the details into two other classes, this script can be short and sweet. print "T = " + str(value) + " C"
If you just did the Seven Segment experiment, you may need to free up your GPIOs in the filesystem. Run the unexport commands outlined in the previous experiment before continuing. Now run the STK08-temp-sensor.py script and watch the terminal for output. You should see the Omega printing the temperature in degrees Celsius measured by the sensor once every second. Try pinching the sensor with your fingers and seeing what happens! T = 25.562 C        # pinching the sensor here! 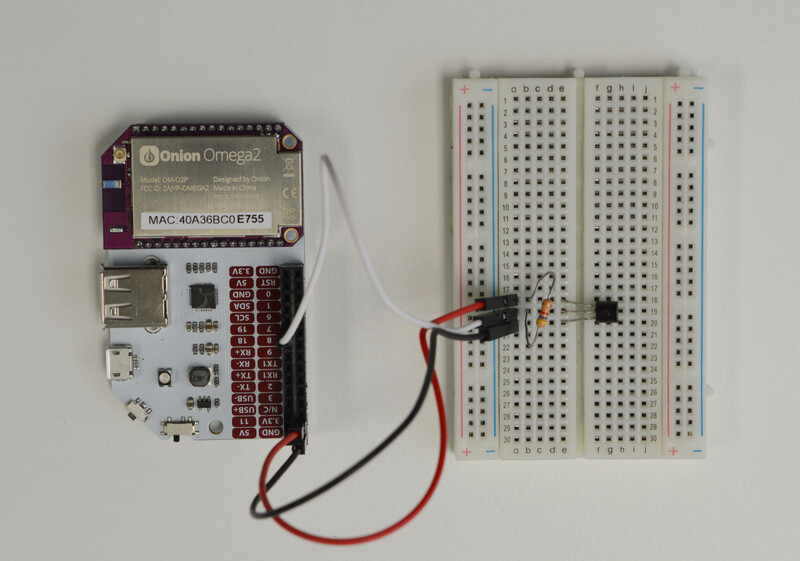 Here we control a 1-Wire device through the Omega’s filesystem by reading and writing files. We also introduce the concept of scanning a bus for devices and device addresses. We’ll also explain the __name__ == '__main__' concept - what it does, and when should you use it. The Omega’s hardware such as the serial ports, I2C, and SPI bus are exposed as files somewhere in the system (in fact, this is true for most Linux systems). In order for software and programs to interact with these connections, they must work with the corresponding files by reading and writing. This is a very important concept, so please make sure to remember it! This applies to all programs that interact with the filesystem, not just Python. Hardware connected to the Omega’s ports are represented by ‘virtual’ files in the system, usually listed under /sys/devices. The process to interact with them directly is to read and write to those files! This calls a system command (insmod) to set a specific GPIO to act as a 1-Wire master bus. The command sets up the specified GPIO as a virtual file that we can then read and write to as a 1-Wire interface - /sys/devices/w1_bus_master1. This simple 2-line block reads from the slave’s system file at /sys/devices/w1_bus_master1/<address>/w1_slave", which triggers the Omega to physically send a request to the 1-Wire sensor and return the data to our program. The file is then automatically closed once the program exits that block. Here, the slave object is a Python File Object and we read it just as we would a regular file! You may have noticed that the the OneWire class is used by the TemperatureSensor class and should not need to be imported explicitly. However, for the purposes of this experiment, we included it in the main script to use its scanOneAddress() function. We make sure that the sensor is the only 1-Wire device connected to the bus. We then query the bus for device addresses. The only one that will appear is the one that corresponds to our sensor. This is all done automatically to save you time. Disconnect all other 1-Wire devices from the Omega, then connect your device. cd to the folder containing oneWire.py and start the Python interpreter with Python. The device’s address will then be printed on the screen. Any Python code file can be both executed directly, or imported as a module. When a module is imported, all of the code contained within it is executed and any functions or classes are made available to the program that imports it. But what if your module had functions that you want to run by executing the module directly, but not when it’s imported? Loosely speaking, every file in Python has a hidden __name__ variable. When the file is imported, the value of __name__ is set to the name of the module. For example if your file is called file.py, __name__ will be 'file'. However if the file is run by calling python file.py, Python will set the __name__ variable to '__main__'. Using this behaviour we can make sure importing a module is silent, while any code we want executed when we run the file will still be executed. We do this by placing whatever code we wish to execute by running the file in a function, and checking the __name__ variable to decide whether to call that function or not. That’s it! Now STK08-tempSensor.py can be imported as a module without running its code immediately on import. You can apply this technique to extend scripts that you’ve previously written and reuse them in later files.